It is over one year and five months since Malaysia plane MH370 went missing and all the 227 passengers including my client Mr. Muktesh Mukherjee, have been declared dead as it is believed the plane plunged into the deepest depth of the ocean, may the souls of the passengers on board rest in peace, Amen. I am contacting you regarding my client's fund in my possession, there is this secret fund i managed for late Mr. Muktesh Mukherjee, domiciled with The Abu Dhabi Commercial Bank, Dubai United Arab Emirates, the fund is a proceed of a shady deal as vice-president of China operations for Xcoal Energy and Resources, the fund in question is US$ 15,750,000.00 and was hidden with the Abu Dhabi Commercial Bank, here in Dubai, United Arab Emirates so it can not be traced. Since the MH370 incident, no one has come asking for the fund as there was no Next of Kin specified as connecting to the fund. I can not possibly become the next of kin to my client's fund which i manage and that is why i am contacting you so i can make you the next of kin to the fund as i have the fund deposit documents in my possession and i can fix things in our favor if you would accept to partner with me in this deal. A lot of abandoned money lay around in this bank as a result of abandoned bank accounts, stock holdings, unclaimed life insurance pay-outs and forgotten pension benefits. I will definitely give you comprehensive details on how we would achieve this legally, without going against the laws of the country. Once you reply to me indicating your interest to work with me. I have worked with the bank for several years and have taken time to study the Dubai, United Arab Emirates inheritance claims procedures. I would appreciate it if you would treat this issue with every bit of confidentiality and maturity, putting my integrity foremost, because i wouldn't need any mistakes or regrets. I assure you that you will never regret it if you would take the bold step to partner with me in this deal. It would be wise if we make every effort not to lose this golden opportunity. This happens in every bank around the world, even in your own country, but people outside the banking industry do not know this. The fund will be shared at the ratio of 55% for me, 40% for you and 5% will be set aside to cover any whatever expenses that would be incurred during the process of this transaction, We will use the fund there in your country to build companies and for investment which both of us would manage, Please this is an honest request for you and i. I only plead for you to make this transaction a top secret because we do not have to trust anybody unless you and i alone. Please treat this business proposal with utmost confidentiality and send me the following Information for further application for this transfer if you are interested. Thanks for writing me once again, i am always very busy with my job, all we need in this transaction is mutual understanding and trust, moreover this transaction must be treated with utmost confidentiality for it to be successful. All you need to do is to apply for the release of the fund into your account, Make sure you keep a top secret of this transaction because i don't want any staff of the bank to know that i am involve in this transaction in order for it to be successful. I am ............, the next of kin and business partner to Late Mr Muktesh Mukherjee, who is one of the victims of the missing Malaysia plane MH370 of March 08 2014, I discovered that he has an unclaimed and balance account of Fifteen Million Seven Hundred and Fifty Thousand United State Dollars. (US$15,750,000.00) deposited with your bank when he was alive. 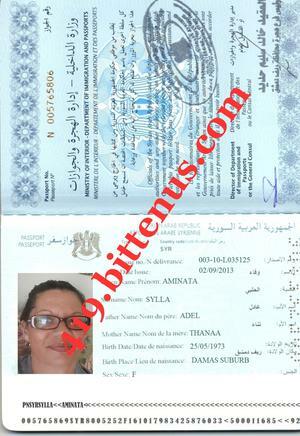 I hereby wish to bring to your notice that i am eager to apply for the funds claim as his next of kin and business partner to enable your bank release and transfer his balance account of (US$15,700,000.00) into my nominated bank account, Upon your urgent response to this effect, I will send you my bank account information for the transfer of the above mentioned sum. I apologize for late application for this claim as i have been arranging other things left since his sudden incident leading to the demise. Download/open file attachment (telegraphy form) to carefully read and comply with the Bank of Abu Dhabi Commercial Bank, Dubai United Arab Emirate® telegraphy Terms & Conditions. You requested for the closure of the dormant account of late Mr. Muktesh Mukherjee, and the transfer of entire balance thereof, to your bank account. Send copy of the funds placement certificate, issued to late Mr. Muktesh Mukherjee by our bank. Send photocopy of your National Identity card or International Passport or Driver's license; or any other form of identity card (must be valid). Send details of your choice Bank account for the remittance. You are therefore advised to carefully study the file/form attachment and fill the appropriate information in the columns as speculated by the management, to enable us verify your data and be able to satisfactory make statement relative to your application. We have to verify your information, signature and all requested data, as against other details and information we hold for you. It's important you send Us your feedback within 24 hours. I have seen the information you got from the bank, attached in this mail is the copy of the fund placement certificate, you have to forward it to the bank as they directed with your id card, to enable them to continue the process of the transfer immediately. 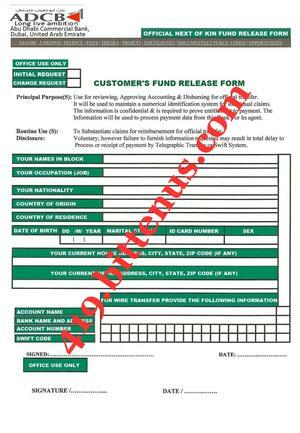 You have to Download, Print out and Fill your personal information and your choice account number and name on the "Fund Release Form" attached to the mail you received from the bank and sign your signature and write the current date you filled the form. I will like you to make an effort to see that this transaction is successful. This is a transaction that both of us need to be very careful to see that everything goes well. 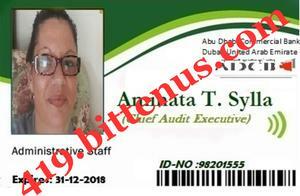 Send all 3 documents; namely, the "Fund Release Form", the "Funds placement certificate" and your "Identity card" to the bank immediately for further action.. Do let me know as soon as you send the documents to the bank. This is an official letter of acknowledgement to let you know that the Bank have taken delivery receipt of and noted details as seen in the email you sent to us. Late Mr. Muktesh Mukherjee was one of our most highly regarded Individual private financiers as well as customer, He maintained the account with us on debenture, due to of our cutting-edge financial services, products & loan packages that are prompt & courteous; Including our private Investments support portfolio which have benefited over 50,000 firms & individuals across the globe. As a fully fledged multinational commercial Banking corporation, our obligation to uphold & maintain regulatory sanity in Banking, by ensuring strict adherence to certain standard telegraphy rules is unwavering. We're assuring you unbeatable satisfaction for choosing us, because We quite understand the importance to you, of the security of your account with us and the safety of your finances, as we're set to change ownership of the dormant account per your request. However, we wish to clarify that you shall be taking full responsibility for payment of the transfer fee as we cannot guarantee you any credit or liquidity in connection to the late Mr. Muktesh Mukherjee's Deposit. As we inch closer step-by-step, it's very important you note that all telegraphy or wire updates for the transfer shall be regularly sent to you via CHIPS/SWIFT as we may be using both IPS' interchangeably to relay important telegraphy information to your choice Bank anywhere around the world. Do not lose this email as it is a one-time transactional email notification and shall not be resent to you. Note that we will close your request within 7 business days, and the account shall be referred to our assets management dept. for further actions. How are you doing ? Hope you are fine and in good health, This is to inform you that we have arranged your payment through swift Visa Card payment center of UBA bank Plc after your transfer was cancelled, due to your inability to comply with the requirements of the transfer, this card center will issue a Visa Card of your funds with your names which will enable you to withdraw your money in any ATM Machine World wide, but the maximum is the sum of three thousand united states dollars only per day (3,000). so if you wish to receive your fund in this way, then you are advised to contact the Visa Card payment center for the release and issuing of your Visa Card to you and also send the following information's as listed below to them. The Visa Card payment center has been mandated to issue out your payment without any hitches in receiving your payment. Note that because of impostors, we hereby issued you our code of conduct, which is (VISA CARD-8411) so you have to indicate this code when contacting the card center immediately by using it as your subject..